Here on the east coast, comic con season is upon us! Yes, for many, this is truly the most wonderful time of the year. Of course, the big dance occurs in the Big Apple; NYC. 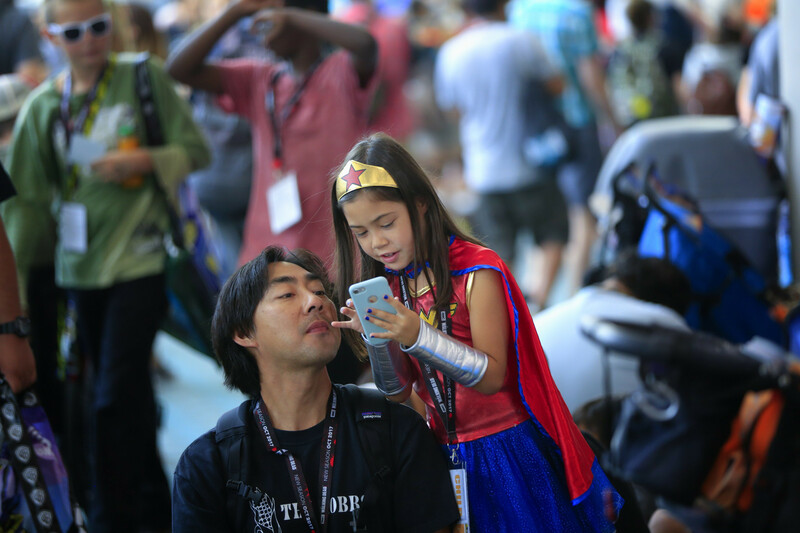 New York Comic Con, or NYCC as it is affectionately known, draws thousands of attendees to the Jacob Javitz Center and a good portion of those costumed devotees bring along their kids. So, exactly how do these comic con stalwarts survive such an action packed day with their little ones? Fear not, my friends! As a four year veteran of tackling one of the biggest cons in the country with my own kiddo, I am here to help you survive this extremely exciting but challenging day. You can thank me later…you know, after you’ve removed your cape and cowl. We all know that kids LOVE to dress up like their favorite characters. This is a truism that does not require any special circumstances. Kids don’t need a reason to don a costume. That being said, when a kid plays dress up at home, he can remove his costume pretty easily if he decides playtime is over or he just no longer likes the outfit (they can be fickle little buggers-in case you didn’t know). At a comic con, however, it’s not so easy to simply discard one’s kiddie cosplay. If you are venturing out to comic con with a young child, it is advisable to steer clear of the “complicated costume”. Sure, little Johnny might look absolutely adorable dressed up like Galactus, but chances are, within an hour, he’s going to decide he just wants to be a mere mortal again. It is, therefore, best that you go simple. A comfortable outfit that he can easily slip out of and/or wear his street clothes underneath will save you from cranky toddlers who want to disassemble their 42 piece bodysuit and demand that you cart it around. Food at comic cons is expensive and you, my friend, are a captive customer. I mean, really…you’ve waited quite awhile to get inside the convention center, do you truly now want to leave the facility to pick up a few dirty water hotdogs from a corner vendor? No, you do not. This is exactly what the food vendors at comic cons are banking on. They’re hoping that you will pay eleven dollars for a fluffernutter. Do not fall victim to their nefarious plans. Instead, bring several snacks that you can easily transport. Use an insulated lunch bag, incorporate a small satchel or backpack into your or your child’s costume. You’re an adult, you can figure it out. Just don’t be a Joker and succumb to the insanity of paying through the nose for convention food. That is unless you don’t enjoy carrying around all that pesky cash. In which case, please let me know. I’d be happy to hold it for you. Ok, maybe not all the activities, but many conventions have a healthy amount of entertainment for the little ones. At NYCC, Sunday is “Kids Day” and they do not disappoint. Kid themed activities include video game trials, face painting, virtual reality adventures, game show simulations and even Lego building workshops. NYCC also hosts a kids’ cosplay contest. As any parent knows, a busy kid is a happy kid. Busy kids also become tired kids, who will sleep very well when you return home. So tucker them out with their choice of kid-related fun. You’ll have some very contented youngsters and you won’t drive yourself nuts trying to keep them distracted. Lines at comic con are inevitable. At some point, you will be waiting on one. It may be the line to get inside the convention center, the line to meet a popular star and get her autograph, the line to play the hottest videogame or meet your child’s favorite author. Knowing that kids hate lines almost as much as they hate pulling off band-aids, you must be prepared. Bring a tablet pre-loaded with games or a movie you’ve downloaded. Bring a book, bring some music-anything to keep your kid occupied and to help pass the time. Before you know it, you’ll be taking a selfie with Lou Ferrigno and explaining to your toddlers that they just met the real Incredible Hulk. One of the things my daughter and I enjoy most about comic con is simply wandering the convention floor. We like to coordinate our cosplay, so oftentimes we are stopped and asked to take pictures with convention attendees. Other times we’ll find a costume we think is incredible and ask to have our photo taken with a talented cosplayer as well. Many times, there are exhibits devoted to current superhero movies. For example, last year we got a chance to see the various costumes and set pieces from the upcoming Wonder Woman film. You never know who or what you will see at a comic con, so don’t be afraid to divert from the plan and wing it. Maybe you’ll even find a panel discussion that you will all enjoy! Even if that isn’t the case, chances are you’ll encounter something really amazing and make some lasting memories. So, now that I have prepared you to take on the show, you have no further excuses. Throw on your capes and tiaras, load up the car seats and head out on your next great adventure. Comic cons are not just for geeks and pop culture enthusiasts. They are for families too. You’d be hard-pressed to find an activity more diverse and enjoyable than one where you get to hang out with superheroes all day. Your kids are waiting…to the Batmobile-Let’s Go! Or….maybe consider taking the train. Parking a turbine powered armored vehicle is a lot more difficult than it sounds.